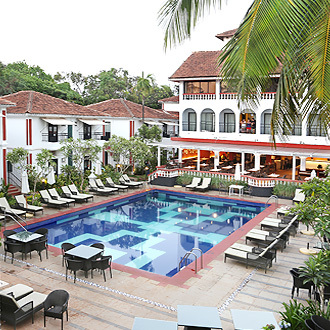 Ronil Beach Resort is a 3 Star property, located 500 mts from Calangute Beach. 126 rooms overlook two spacious swimming pools here, and the hotel also has an in-house Continental restaurant. An A/C coffee shop provides a good setting for a casual get-together, and a pool table awaits those looking for recreation. A conference hall with a capacity of 100 people is available, and one can de-stress in the indulgent environs of the beauty parlour and the spa.